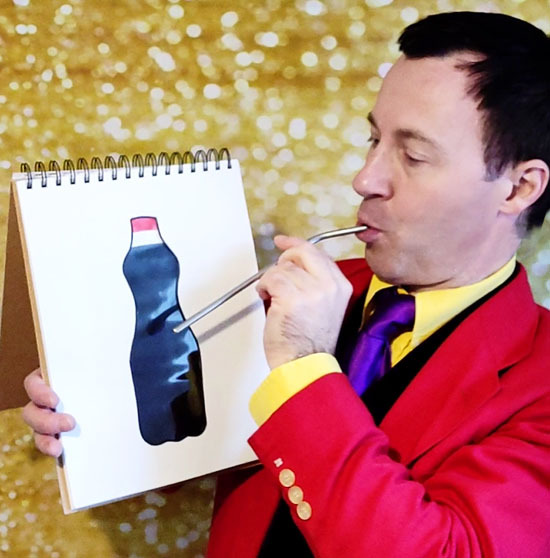 Top children's entertainer and magician ANDY HICCUP delights and excites at children's birthday parties, magic shows and school shows. He is ideal if you are looking for a top children's entertainer or magician in South London and Kent. From Beckenham to Bromley, from West Wickham to Croydon, from Swanley to Sidcup, he is reliable, experienced, friendly, fun and brilliant with children. He has great energy, great enthusiasm and creates great excitement wherever he goes. Andy Hiccup was formerly known as Boo Hiccup, especially in the Bromley area, so if you're looking for the children's entertainer Boo Hiccup then he is one and the same. As seen at thousands of children's birthday parties (as booked by the great mums and dads of the world) he also entertains at company events for the likes of Walt Disney Special Events, 10 Downing Street, The Barbican, Butlins, Legoland, Thorpe Park, Chessington World of Adventures, the Hurlingham Club, the RAF Club, London Zoo ZSL, Barclays Bank, Goldman Sachs, Sky TV, Microsoft, Audi, Lloyds, RBS, Royal Caribbean Cruises and many more. Andy Hiccup is the perfect choice if you are planning a children's birthday party, wedding or event of any kind and is most definitely one of the best childrens entertainers in the area. 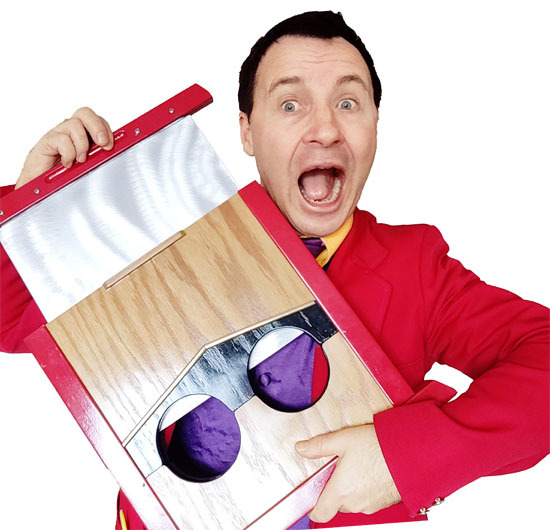 Andy entertains with a most marvellous and merry mix of comedy magic, cheeky puppets, close-up magic for kids, balloon modelling and party games, whatever is appropriate for your event. Fantastic! Andy is a whizz at entertaining children at birthday parties, weddings and other family occasions too. He will delight and excite in equal measures, and has tons of super skills keeping the party thoroughly fresh throughout. Performing impressive magic and very funny with it, Andy will amaze you with his splendid conjuring skills. There's audience participation every step of the way, and shows can be as long or as short as you need them to be. 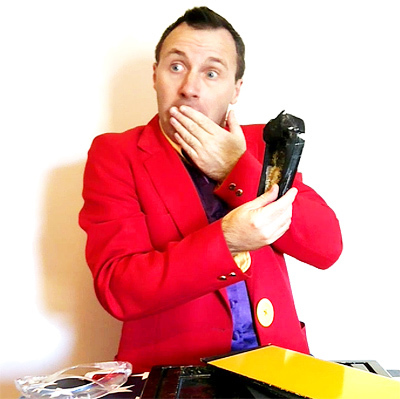 Andy Hiccup's fabulous and very funny magic shows are ideal for all kinds of family and children's events. His magic shows can be as long as you need them to be and you can just have the one, or they can be repeated throughout the day as many times as you like. Each and every show is packed full of of hilarity, audience participation and truly great magic. Andy's magic shows are ideal for schools, festivals, holiday clubs, seasonal events, corporate parties and family fun days. Andy has loads of amazing magic routines for all ages. His magic for younger children is jolly and colourful, his magic for older children is edgy and daring, and many of his routines appeal to all ages too. Andy can entertain your children in whatever space you have available for him, from small front rooms to village halls to large amphitheatres. Andy entertains at festivals, fetes, school days and company parties with his amazing and amusing walkabout magic; smaller tricks out of his pockets and larger routines out of his suitcase. Many children's entertainers only do birthday parties up to the age of 5 or 6. Andy is quite happy to entertain children up to the age of 11 or 12, sometimes even older. WHAT AREAS DOES ANDY HICCUP COVER? Andy Hiccup entertains at children's parties in Bromley and the surrounding areas - Bromley, Beckenham, West Wickham, Sidcup, Swanley, Catford, Bellingham (he lived there for seven years! ), Orpington, Chelsfield, Penge, Hayes, Biggin Hill, Caterham and everywhere in between. He's even happy to cover a wider area than this, including most of Sussex, Surrey and South London as well.